It’s that time of the year again. When the frosty blues and grays enveloping the surroundings start to disappear and in their place awakens a plethora of colors, fresh and vibrant as if after a long hibernation. As if by magic, peoples spirits start to soar, life starts looking more, excuse the pun, ‘sunny’. This was especially true when I was growing up. Since as soon as the flowers started appearing, so did simultaneously kites all over the sky, with people getting ready for the much awaited Basant festival. I used to love Basant when I was a kid. My Khala (maternal aunt) would have a huge Basant party on her roof top. Family and friends would dress up in bright yellows, with the guys busy on the rooftops, and the ladies in the kitchen busy conjuring up some of the most delicious food for lunch. Everyone would have the yummy food on the rooftop, and everyone would spend the whole day on the roof top, just simply enjoying life. People would engage in friendly competition with the neighbors, and literally have conversations over rooftops. The skies were full of kites, laughter, music and shouts of 'boo-kata'. 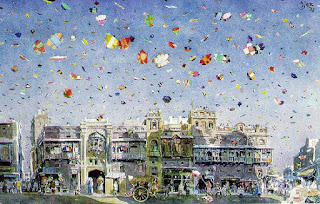 Basant was an event that brought the whole community together, something that is very rare in todays time. 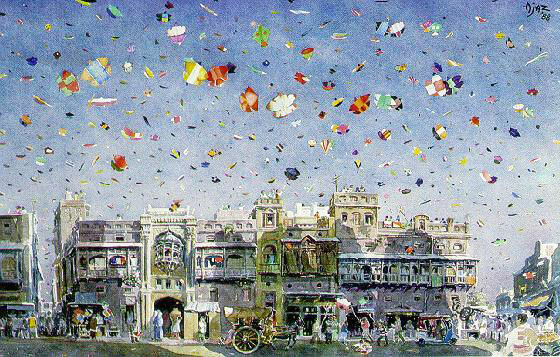 Basant was special since it was a festival for the rich, the middle class and the poor. I would have taken more pictures back in the day, had I known that Basant would one day be banned. I have some amazing memories of Basant. My Khala was an amazing cook, and my elder cousins would go hunting some days before. My Khala would cook Murghabi (wild duck) and on some rare occasions venison (deer) meat curry also. When I was a young kid, I would go ask my elder cousins to fly me a kite and then hand it to me when it was in the air. Once it started going down, I would call on them to make it fly higher again. We would chase after kites, and overall the day is associated with laughter, joy and fun. Some people however decided to take the friendly competition a little too far. They started making chemical dors (strings), which turned out to be lethal and claimed innocent lives. The kites also started getting better, due to which the string got thicker and similarly lethal. This whole turn in kite flying claimed a lot of lives, which led to Basant being banned in the year 2005. I am totally against anything that would claim so many innocent lives, particularly victimizing the poor motorcyclists. However I wonder if lives could be saved, without sacrificing a Pakistani tradition as old as our country itself. I wish the courts had focused more on what turned an otherwise safe event into a dangerous life threatening one. Instead of taking the easy way out, maybe if we all had taken responsibility of what was happening, Basant would still be here. I believe a better solution would have been the regulation of kite sizes and especially string types, so that dangerous string that can claim lives not be used. Harsh fines and punishments should be linked with breaking these regulations, which can literally fall in the grounds of potential murder. Some people would raise their eyebrows on how this would be implemented. I feel that if the legislature has so far quite successfully managed to keep a curfew of 10pm at an emotional affair such as weddings, this is very possible too. If the courts do their part to bring back the festival, then the citizens must do theirs too. Our media is playing a powerful role, and it can help spread awareness of the dangers of Basant, so Pakistanis start to take a responsible approach towards their lives and that of their fellow citizens. It can highlight how carelessness can cause deaths on Basant by falling over rooftops, how chasing kites is not half as important as saving your life and how people should explain safety to their children before the festival. Everyone who has seen the true spirit of Basant misses it to this day. I believe that instead of being overwhelmed by withdrawal symptoms, there is another safer, rational way out which can save lives and at the same time return a much cherished festival. The verdict lies with the Pakistan courts.